I’m a slow sampler. Since I normally only drink a tea a day, and since I am no longer in the mode of drinking new teas I don’t know every day, it sometimes takes quite a while for me to get to samples that I intend to taste. A few months ago, Eugene of Tea Urchin did a sample trade with me – I sent him a bunch of teas, he sent me a bigger bunch of teas. I’ve tried some of them so far, but I still have a few that has been left unopened. 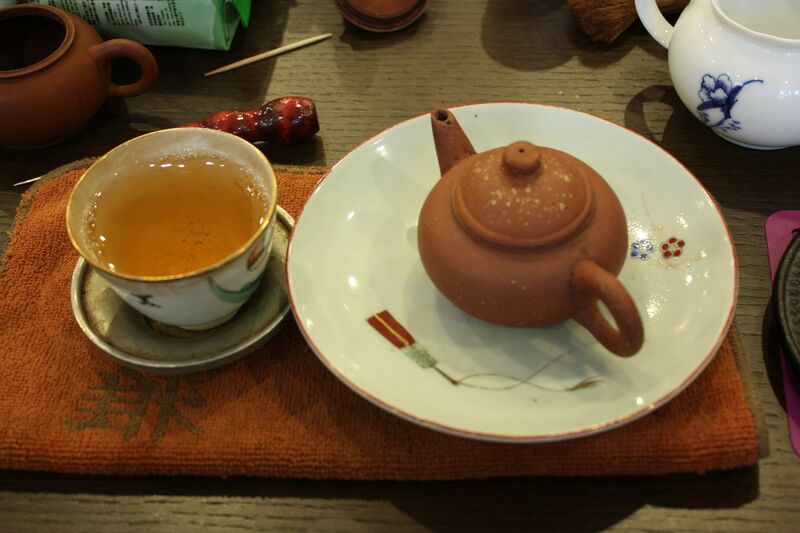 One that I tried recently is the Guafeng zhai 2011 Fall tea that he made. There’s been a general trend in the past six years of increasing specificity Guafeng zhai is one of those villages in Yiwu that popped out of nowhere and, over the course of a few years, gotten really famous. Nowadays, you even have sub-regions of Guafeng zhai that are showing up as single-estate regions – Chawangshu, Chaping, and Baishahe. Other places, like Wan’gong, Tongqinghe, etc, are all appearing these days as places of good quality. So, increasingly, we’re talking not only about regions of tea (Yiwu) but down to specific villages, often of relatively small sized areas. I guess this is the beginning of appellation claims. Tea Urchin gives generous sized samples. It smells like Yiwu when you open the bag. It also smells like Yiwu when the leaves hit the pre-warmed pot, and it, again, smells like Yiwu when I pour out my first cup after the wash.
Guafeng zhai has a very strong umami taste to the tea produced there, and it tastes a bit more “wild” than some of the cleaner, brighter villages of Yiwu, such as Gaoshan zhai or Mahei. I find teas from Guafeng zhai to be a bit darker generally, and with lower register notes than areas that used to be considered Yiwu proper (Guafeng zhai is basically on the outskirts, right next to Laos). This tea is no different – deep, a bit dark, with notes that remind you of Yiwu, but also has that spicy/umami note that sets it apart a bit. The throatiness comes and goes in this one, but it has good qi that persists. It also suffered a good many infusions. It reminds me of the nights I spent drinking new Yiwus in my Beijing apartment back in 2006. This is good tea. 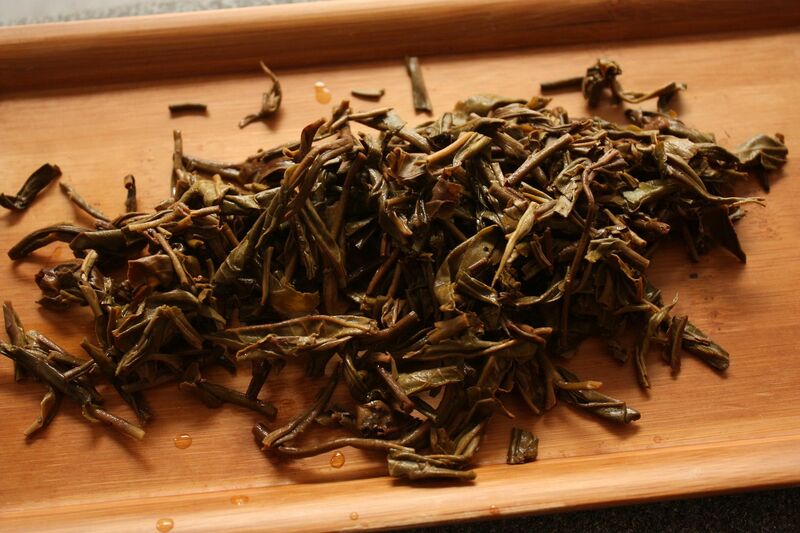 This is, I think, tea that will do well in the future, fall or spring. Just because something’s from the spring doesn’t mean it’ll be good, and likewise, just because something’s from the fall doesn’t mean it’ll be bad. Yes, side by side, from the same trees, the spring might be indeed better, but so many other factors, including weather, processing, etc, go into the production of tea that relying solely on season is probably not the best approach. There’s been a few reviews of this tea by others already, and aside from Hobbes, the reviews have been positive. There is, however, the matter of price – and I have heard complaints, almost universal now, about prices of new tea in general and, if the comments on my last notes on Tea Urchin were an indicator, specific to this vendor. What, exactly, is a fair price for newer teas? Many of us remember the days when new teas can be had for $20 a cake or less. In fact, I remember in 05 or so, a cake of Haiwan’s Laotongzhi was under $10 USD when new. It was almost free, considering you’re getting 357g of tea from it. Those days are long gone, especially when you are talking about higher end boutique made teas claiming old tree status. I was at the recent Hong Kong Tea Expo, and prices were uniformly high – a decent new cake would cost no less than about $40, and that’s sometimes very average quality stuff. Teas claiming to be from old trees (not all of which tasted like it, mind you) are often sold for $80-100 USD, or more. I bought a cake that was priced at $80 for a new, 2012 spring Yiwu. 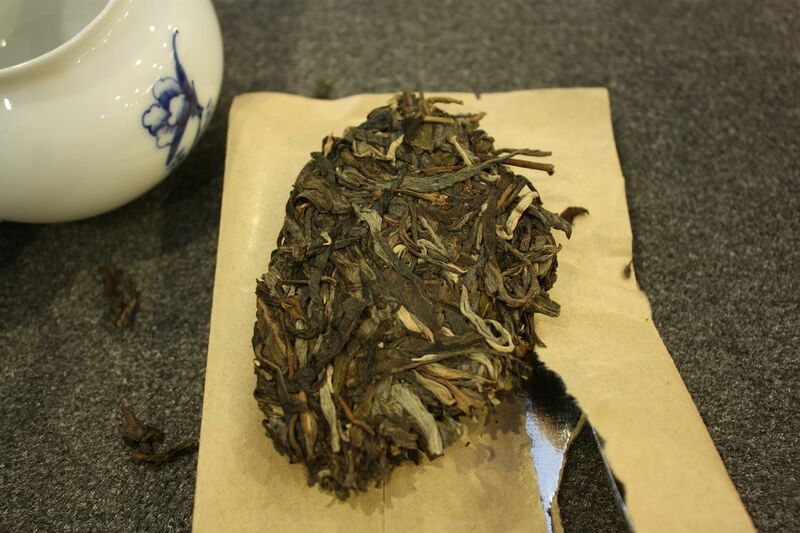 I also went to a shop a few weeks ago in Shenzhen that sold new 2012 teas at almost $200 a cake. Granted, these are spring prices, which are a bit higher, but high prices are here to stay and they’re not going to go away. In fact, it’s only going to get worse. The supply of old tree tea is relatively limited, and there’s no good way to scale production – you can’t just make more. So, as the market for such teas expand, the prices will keep going up until it reaches that equilibrium where prices no longer go up because it’s already so high that it knocked everyone else out of the market. That day is coming, and not too far either. Does that mean you should throw all your money in now to buy these things before they get even more expensive? I’m not advocating that, since I can’t read the future and don’t want to give investment advice. One thing I have learned though from 10+ years of tea drinking is that when I see a tea I like, I now tend to buy a lot of it, as long as I can afford the purchase. Some things are going to be there forever, and cannot keep, so there’s no point in buying lots – fresh Longjing, for example. In other cases, however, the teas that you like will go away, and you’ll never see it again, ever, anywhere. I recently tasted a nice sample of a tea from 2006 that I’d love to get my hands on, but I haven’t even seen it on sale after searching high and low, while the 2007 version is over $250 USD. Chasing teas is a dangerous and expensive business. So, back to the point, I like this tea, but I’m not sure I want to buy lots of it. In the meantime, I’ve just ordered a sample of every 2012 tea that Tea Urchin has made. Given the large sample sizes, I guess I have some time to make up my mind. did you heard about gu lao yin zhen 古劳银针. It is also a tea sold by hung chong tai tea. Is it a pu er also ?